In this piece I attempt to delve into the tactically brilliant mind of Louis van Gaal. How will he approach the game? Who will play? What’s he been saying in the tactical meetings? Once we go down this rabbit hole there’s no telling what we’ll find. If I tug on the rope twice, pull me out. Last week, Van Gaal demonstrated that even in big games, he is going to stay within the framework of his philosophy. Against Chelsea, he resisted a reversion to the counter-attacking ways of his Netherland’s side, and opted to remain loyal to the philosophy he has instilled at United. Regardless of the overarching style of play, any system must be tweaked for big games. Against Chelsea, the worry was that Jose Mourinho’s men would sit deep and make it very difficult for United to break them down. Instead of drastically changing the system to combat England’s top side, Van Gaal instructed the team to stubbornly play the ball all the way out from the keeper; in essence, this risky strategy pulled Chelsea out of their shell. But how will Louis van Gaal approach the Manchester derby? Manchester City are wounded. In their last three games they have drawn to CSKA Moscow, lost to West Ham, and lost to Newcastle. In addition, as if to add injury to insult, City will have to soldier on this weekend without one of their most influential players, David Silva. Louis van Gaal will see this as an opportunity to capitalize, an opportunity to dominate; the shark smells blood. Van Gaal has set the team up in a 4-3-3 for two consecutive games, and to good effect. In addition, it also provides United with a numerical advantage in the middle of the park. Jones will replace Smalling, provided he is fit enough, and captain Wayne Rooney will come into the team for Mata. The rest of the team is unchanged, with both Marouane Fellaini and Adnan Januzaj retaining their places after impressive performances. 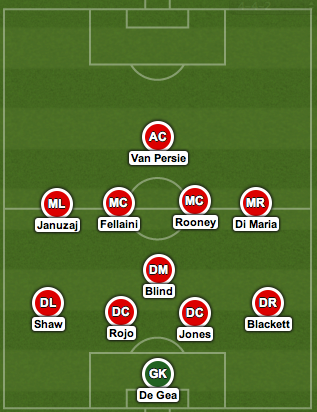 Given the match, this is the best lineup and formation available to United at present. Due to Manchester City’s recent form and questionable defending, United don’t have to approach this as the away team. After matching Chelsea in their last outing, United approach this game with a growing sense of confidence. Ironically, although a derby usually prompts a change in tactics, the situation actually favors the blueprint Louis van Gaal already has in place. However, Van Gaal must first decide what modifications he will make to the blueprint in order to expose Manchester City. City’s style under Pellegrini is essentially fast, attacking football. They attempt to pass the ball up the pitch, with an emphasis on short and swift passing combinations. Although Manchester City sometimes lineup in a 4-2-3-1, they usually lineup in a variant of the 4-4-2 formation, commonly referred to as a 4-2-2-2. This allows them to place four players in advanced positions, which supports their attacking ethos, yet it also contributes to their defensive woes. Van Gaal won’t set United up to play on the counter, however he will instruct United to use the counter-attack whenever the opportunity arises. When City attack, the wingers push inside and Yaya Toure ventures forward, along with the outside backs; potentially leaving City with only three players back. Tempo is key to United’s tactics against City, and in the instance that they win the ball back when City are exposed, they must exploit it with quick tempo passing focused on flank play. This is the tweak, or modification, that Van Gaal will employ. While he would usually instruct United to retain possession and build from the back once they win the ball, he will instruct the players to look to counter-attack more often in the derby, should the opportunity arise. Aside from this tweak, there is no need for Van Gaal to alter how United play when in possession. The style he has employed at United is well suited to the match; it allows the team to dominate the game against a City team that is lacking in confidence. United outnumber City 3 v 2 in the midfield area, and this should allow them to do what Van Gaal loves to do, control the game. If they choose to close down Daley Blind, then Rooney is free, if they close down Rooney, then Fellaini is free, and so on. Once again, tempo is key. Provided United cannot counter-attack with a fast tempo, they will control the game with a slower tempo. As they have done countless times this season, United will patiently probe, moving the ball from side to side across the pitch, in a bid to pull City out of position and create scoring chances. United’s play will depend on their ability to strike a balance between slow and fast tempo. Ironically, a slow tempo provides the opportunities for a team to penetrate with a fast tempo. United will attempt to frustrate City and wait for them to dive into a challenge or fail to shift properly, per say; once City do this, Van Gaal will be instructing his men to strike with a quick passing move. I reckon Louis van Gaal will employ a version of the tactics he used against Chelsea, where United used their ball retention skills to draw Mourinho’s men outwards; against City, United will use the same philosophy to draw City inwards. If United begin to control the game in the middle of the park, City’s players will compensate and gravitate inside, creating space out wide. If United can switch the ball quickly enough, it provides United’s dangerous wide players with a chance to strike. Van Gaal will be instructing his team to be patient. City are wounded. Dominate the game and force them into a mistake. The frustration approach. Once again, this game plays into Van Gaal’s hands tactically. United will attempt to do something that they have done all season defensively, clog the midfield. Van Gaal instructs the defensive line to push up fairly high, but the forwards aren’t usually instructed to press more than 10 yards into the opposition half. This forces the opposition to play in a very small amount of space. Van Gaal instructed to Fellaini to man-mark Fabregas in the match against Chelsea, and it worked to devastating effect. The Spaniard only completed 3 passes in the first 20 minutes and 11 in the entire first half. If Yaya Toure was playing well, I would be willing to bet that Van Gaal would ask Fellaini to give him the same treatment that Fabregas received, however, given his form, I find it unlikely. If Fellaini is asked to man-mark Toure, it will change to a 4-4-1-1, with Fellaini pushing forward and Blind playing alongside Rooney. Nevertheless, United’s strategy will be to stifle City’s best asset, speed of play. City are most dangerous when they are allowed to engineer swift and incisive passing moves, which are near impossible to defend. Clogging the midfield prevents City from doing this. Pellegrini instructs his wingers, and occasionally Aguero, to come inside and look to pick the ball up in the channels. Because of this, United’s five man midfield must be aware of their surroundings; if the shape, a high line and a five man midfield, is kept, then it will be very difficult for City to pick up the ball in these pockets of space. Well, I made it out alive! How do you think Van Gaal has instructed the team to approach the game? Jump into his mind yourself, if you dare, and let me know what you find! Leave your thoughts in the comment box below.